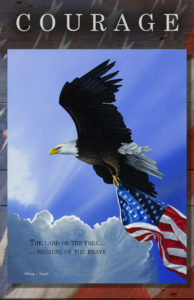 For the Holidays: Celebrate and honor veterans and servicemen special to you by purchasing this beautiful plaque or framed canvas print featuring Anthony J. Padgett’s 2015 painting, “Our Glory”. It will be personalized with the honoree’s name and rank at the bottom. A great gift for any who have served our country. To purchase, simply click on the image below to be routed to our online store and use promo code VETERAN to save 20% through November 13th.